Our children are Okinawa’s future. It is necessary to create the sort of society thatensures that all children who want to learn and have goals to attain can fulfill their potential to the fullest, regardless of their parents’ circumstances.We should never let the cycle of poverty restrict children’s potential and options. To this end, it is necessary for society as a whole to support children’s education and growth, and for individual local communities to build the sort of new environment that allows their children to live safely and in peace.This page provides basic information with which for you to know more about the Okinawa Children’s Future Support Citizens Movement (“the Citizens Movement below”) led by the Okinawa Prefectural Government. 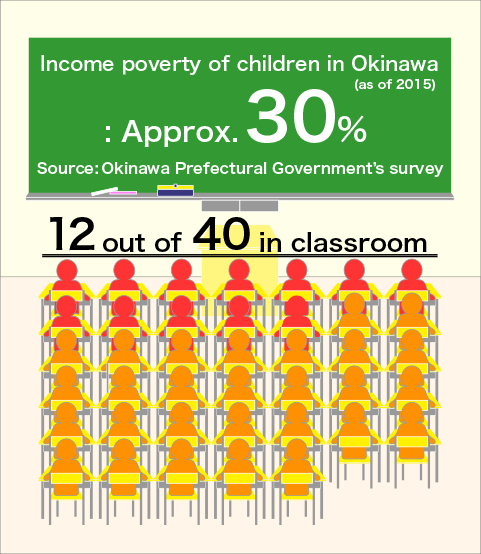 As many as 29.9% of children in Okinawa are in economic difficulties. Results of the survey the Okinawa government announced in January 2016 showed that 29.9% of Okinawan children are in relative deprivation. The Citizens Movement engages in a diversity of programs to meet its purposes by working with people from many different communities. Help Wanted: Supporters and Donations for Okinawa’s Future! The Citizens Movement has programs to apply your donations and warm desires to help directly to helping create a better future for children. For details and how to participate, visit the programs’ Okinawa Prefecture official websites. Your donations will be used to assist children in many ways through our scholarship and other Support Children’s Future Programs, as well as our awareness raising programs. Our goal for donations is ¥200 million per year.